WACO, Texas—U.S. 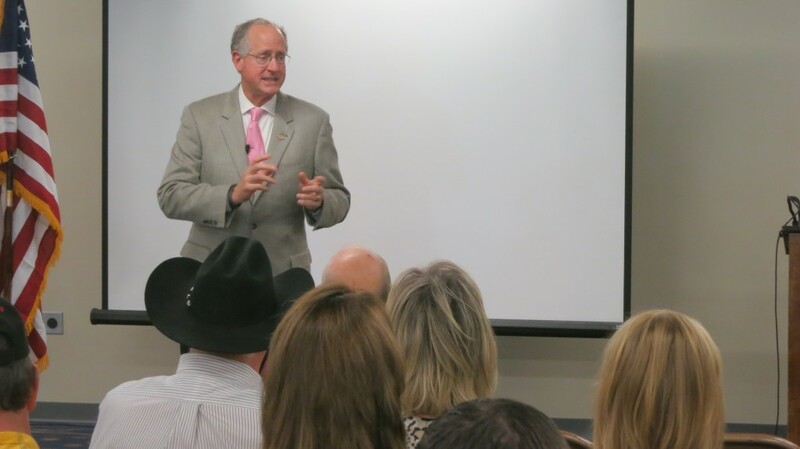 Representative Mike Conaway (R) from Midland spent more than two hours updating Texas farmers and ranchers on the progress of the farm bill today at the 79th Texas Farm Bureau Annual Meeting in Waco. "There is really a pessimistic feeling now in Washington," Conaway said regarding farm bill negotiations. "We didn't take our version of the bill to the floor because we simply don't have the votes to get it passed." The stalemate offers more questions about what happens after Jan. 1 when the current farm bill extension expires. "It's possible we could see a one-year extension," Conaway added. "We all would like to see a full, five-year bill in place, but that scenario is not looking realistic at present." Both the Senate and House versions of the 2012 Farm Bill seek to cut nearly $30 billion in nutrition, conservation and commodity program spending. According to the U.S. Department of Agriculture, one in 12 jobs directly is affected by production farming and ranching. Congressman Mike Conaway (R-Midland) provided an update on the farm bill to farmers and ranchers at the 79th Texas Farm Bureau Annual Meeting.